Content, content, content. It’s the modern marketer’s mantra, much the way real estate brokers say “location, location, location”. Trouble is, creating so much content is a lot of work. The model of Every Business As Publisher can stress out almost any small business marketer. Fortunately, there’s a fix. Instead of creating more and more content, just recycle the content you’ve got. And because the most likely piece of content you’ve got is blog posts, that’s the format we’re using as the template for this content repurposing list. I’m not saying it won’t take some time to repurpose your blog posts into these formats – it will. And I’m not saying you should convert every post you’ve ever written into these pieces. You shouldn’t. All this content reformatting work only makes sense if you are reformatting quality content. So there’s yet one more reason to follow an old piece of advice: Create great content. The good news with content reformatting is that it actually supports the goal of creating less, but higher quality content. Here’s how this might work: Instead of churning out a so-so post twice a week, you publish one high-quality post once a week. Then you add updates when you’ve finished different formats for the original post. Instead of having two updates (one for each so-so post), you’ve got one update for the high-quality post, then two to three more updates for each of the new formats. Here’s where content formats are like eating vegetables. You don’t have to eat/do all of them, but it’s really good for your health and your business’s health if you try at least a few. So try at least one new content format every month. It keeps things interesting for your audience, and it also stretches your skills as a marketer. Which formats should you try? Formats that work best with your current content and formats your audience likes best. Task batching will speed up your work. It’s often easier to convert, say, three blog posts at a time into infographics. Or to record three videos all in one session. That’s enough strategy to get you started. As always, monitor your results. A few of these content formats may work like gangbusters for you. A few may fall flat. 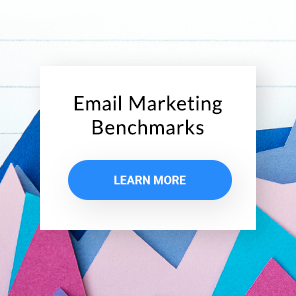 Most of you are probably already sending your blog post updates out as emails. It’s super easy to take a blog post and make it into an email update. It’s so easy, actually, that you can automate it. Just use the RSS to email feature in your GetResponse account. That will give you some good basic controls over the formatting. If you want more control, you can also lay out a simple blog post update email in half and hour or less. This is the first screen you’ll see when you set up an RSS to email automation in your GetResponse account. These are an ideal way to take a small piece of content (your blog post) and weave it into a larger piece of content. Autoresponders are powerful, extremely effective and easy to use. They’re basically set it and forget it marketing. 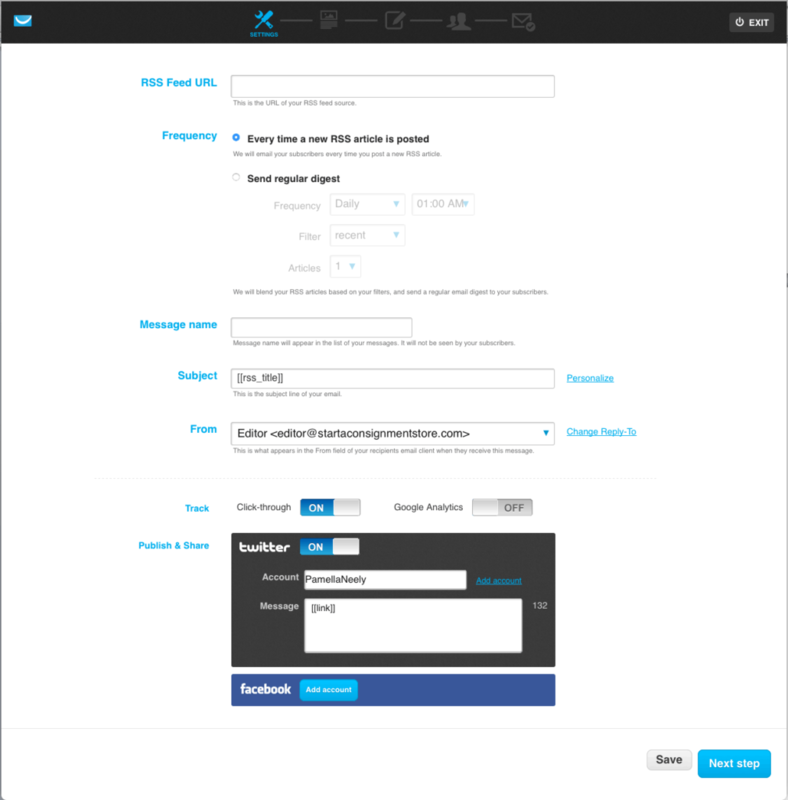 You don’t have to use your entire blog post in the autoresponder message. Feel free it break the post up into 3-4 chunks and put each one in an autoresponder message. Or just take one section of the blog post and add it to a place in your autoresponder that makes sense. These still great shared a lot. They’re also a fabulous way to make your post more interesting. There are several good free or low-cost infographic creation tools, or if you’re good with Photoshop you may prefer the flexibility that allows. There are several approaches to this. The first one is the usual summary Facebook post about a new blog entry. Those are good, but you can take things a step further. If your blog post has 2-3 sections, for example, why not publish a Facebook update that’s focused on each one of those segments? If you’ve got a listicle you could write a short update for each item on the list. Same approach here as with Facebook. Do a summary update, or do a series of more detailed updates. Google+ also lets you publish long-format posts, so you could do a light rewrite of your post and republish it in long form on your Google+ page. We’ll talk about LinkedIn’s publishing program in a moment, but for this item I’m just referring to a summary update to share in your LinkedIn feed. Use a similar approach to the other social networks, but go even finer. There’s probably at least a dozen tweetable sentences in your post. So queue them up. Consider going a step further and setting up Click To Tweet or a similar tool so people can tweet out your wisdom on their own. 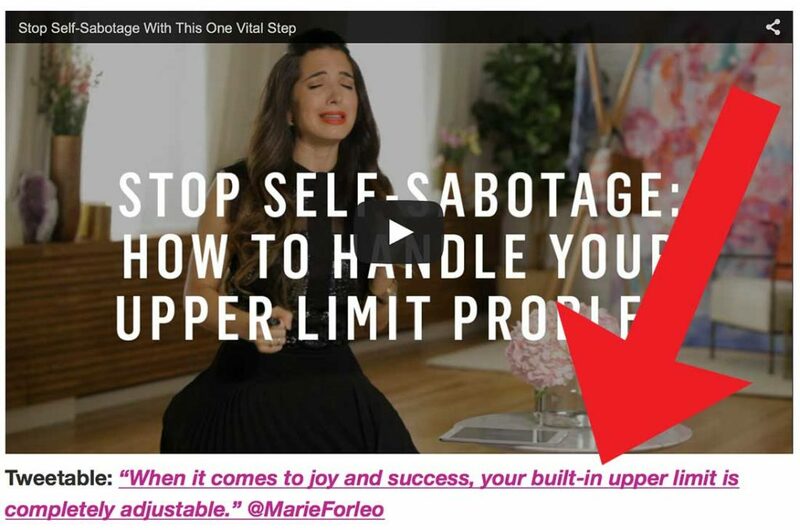 For an example of how to encourage people to tweet your stuff, check out any of Marie Forleo’s videos, where she closes each video with a “tweetable”. You’ve got those twelve or so smart sentences selected already for Twitter, right? So why not share them on Pinterest too? Use a tool like Canva or Pablo to make your sentences look sharp, then add them to a few boards on Pinterest. Extra credit: Those glammed-up sentences can also be used for your other social media updates. Turn your blog post into 10-20 presentation slides and post them on this excellent traffic generation site. If you don’t have PowerPoint, try Haiku, an online tool that creates presentation slides. SlideShare is particularly important if you’re in B2B. That’s because SlideShare is owed by LinkedIn, and so you can embed your SlideShares as LinkedIn updates. You can also embed SlideShares on Pinterest and Twitter. Even if you just take a listicle and turn it into a checklist, that’s a good content upgrade. Other content upgrades could be a list of resources or tools you like to use. 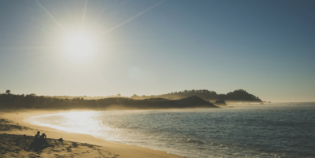 Content upgrades are an ideal way to build an email list. Many of the smartest bloggers are using this technique on pretty much every post they publish. Ever written a series of blog posts about a particular topic? Then you’ve got the bulk of an ebook written already. 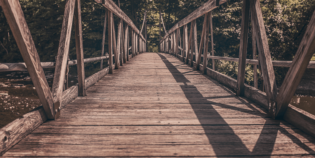 Even without a series of posts, you’ve probably got enough material to take chunks of your existing posts and make them into an ebook or a How To Guide. Quora (and LinkedIn groups) are a great way to build authority, and to see what people in your niche want to know. The odds are good that your blog post can answer at least one question on these sites. As you know, video is big and getting bigger. Whether you add the video to the bottom of your post, or use it as a Facebook update, or post it on YouTube is up to you. Maybe all three? To create a video, either use your PowerPoint slides from the SlideShare tip, or simply record yourself talking. Just keep it short. While you could potentially do a whole presentation from a really detailed blog post (there’s repurposing idea #21! ), your video should be 10 minutes or less. Three minutes or less is even better. If someone wants a longer, more detailed version of the video, just point them to your website to read the full post. These are similar to content upgrades, but they’re specifically formatted to be printed. Checklists are good for this. Grocery lists and gear lists are good, too. A 30-day plan can be laid out as a calendar view. Some bloggers have created cool folding printables. If you’re creating content for parents or kids, coloring pages are a tested content format, too. Same story here as for ebooks. If you’ve got enough content for an ebook, you’ve probably got enough content for a Kindle book. An established blog could create a Kindle book for beginners to attract new people to their work, then offer ebooks on more advanced subjects on their site in exchange for email addresses. This is just one more twist on using a blog post in a larger piece of content. Case studies continue to be one of the most effective content marketing formats. If you haven’t tried one for your business yet, that might be a good content form to test this month. Same principle here as with case studies and ebooks, but with the more technical twist that white papers are known for. Sometimes us bloggers end up researching extensively for a post, but we can only use about a third of that research in the final version. If that’s happened, consider framing a whitepaper around the research the blog post couldn’t fit. If you’ve got a podcast you need content for, adding a segment to each podcast about your latest blog post is a no-brainer. 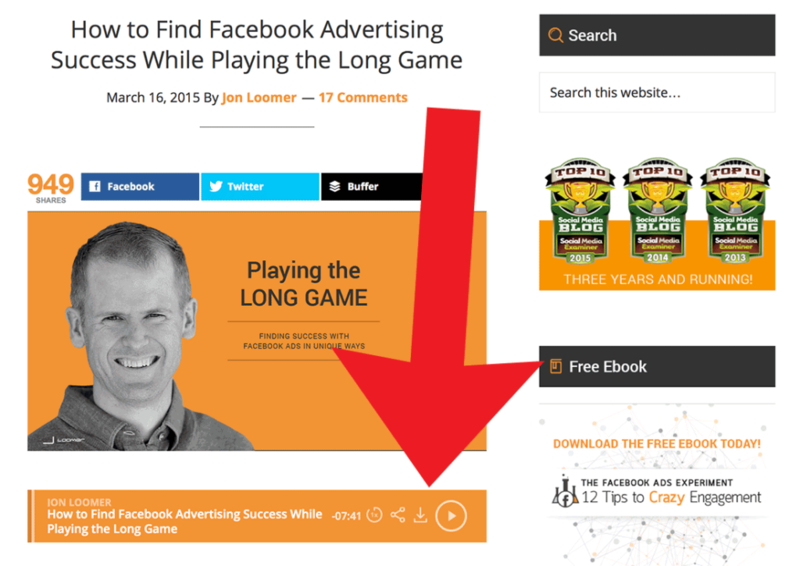 Jon Loomer added an audio version of this post right below the header image. There are many excellent places to republish content. LinkedIn publishing, Medium and Business to Community are just a few. Many bloggers get more exposure from the posts they publish on LinkedIn than they get on their own sites. This is one last twist on the “use your blog posts as segments in larger content” play. We talked about using posts in autoresponder content at the beginning, but you can also use posts in larger, gated membership programs or even Udemy courses. Or you can publish a trimmed down version of the post for the public and offer it as a teaser to a paid membership program. If people join the membership program, then they get the more detailed version of the post. So those are 20 (or more!) ways to squeeze every possible drop out of the content you create. Just remember to pick evergreen subjects your readers will love, and always start with a blog post that deserves this much attention. How are you reformatting your content? Which formats seem to work best? Let us know in the comments.